The closest town to the Spring Temple Buddha is Lushan (Chinese: 鲁山, Lǔshān). From Lushan, there are regular bus services to the Buddha. As there are no airports nearby, your best option is to take a train from one of the nearest big cities. Not all train lines will take you to Lushan. Unless you speak Chinese, it is highly recommended that you find and book your train travel well in advance on the internet. This is for two reasons: 1) train are often booked out completely. If you are buying a ticket on the day don’t be surprised to find there are no trains available – possibly for the next 1 or 2 days, and 2) purchasing tickets online can be done using an English website – trying to book a ticket at a Chinese train station can be very difficult as there will be multiple trains/times, different seating classes, and identification documentation rules to understand. The Lone Traveller recommends using www.travelchinaguide.com/china-trains to book the train. This is because travelchinaguide.com is a very easy way to book your tickets, in English, and they will try to get you the best available seat in the class you choose as soon as they become available (usually 20 days in advance). For this they charge a small percentage fee. As an example let’s say we are travelling from Luoyang, a large close city in Henan province, to Lushan. The first thing to note is that from Luoyang you need to take a train from Luoyang train station (not Luoyang Longmen train station – trains from Luoyang Longmen do not go to Lushan). Go to www.travelchinaguide.com/china-trains, and enter in Luoyang in the “From” box. In the “To” box, type “Lushan [Henan]” (note that there are other “Lushan” train stations, but these are not the same town.. make sure you choose “Lushan [Henan]”). Select your departure date and search. You will now have a set of train numbers (eg: “K758/K755”). You will then be able to book the time and seating class of your choosing. The www.travelchinaguide.com/china-trains page also has a lot of useful information about travelling on trains in China, including the different types of trains, seating classes, baggage restrictions etc. Once train tickets are booked, they can be picked up from a train station in China upon presenting your passport for identification. See www.travelchinaguide.com/china-trains for more information. Catching the bus is the easiest and cheapest way to get to the Spring Temple Buddha. As of November 2017 it costs 13 元 each way, and the bus trip is approximately 1.5 to 2 hours each way. The journey there and back also provides a great view of some of the more rural areas of China as well as some small townships and villages. Alternatively you could arrange to have a local taxi drive you there and back, waiting for you at the Buddha. However this could cost you 400 元 or more, and you would need to negotiate this price and the details with the taxi driver – if you don’t speak Chinese then it may take some effort. It is strongly advisable to only pay a partial amount upon arriving at the statue and pay the remainder on returning to Lushan – negotiate this with your driver before leaving Lushan. 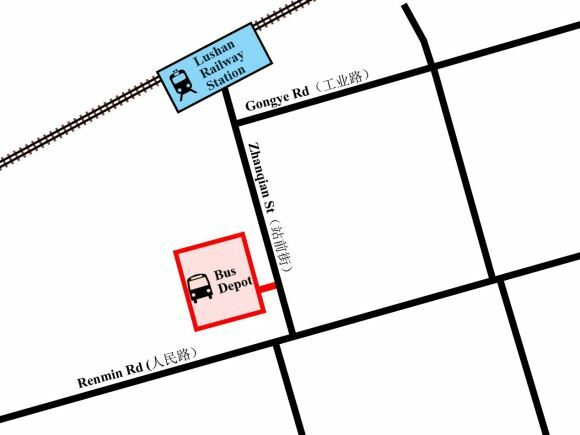 Taxis can be found at Lushan Railway Station. The Lone Traveller caught the bus and found it very simple, cheap and convenient. 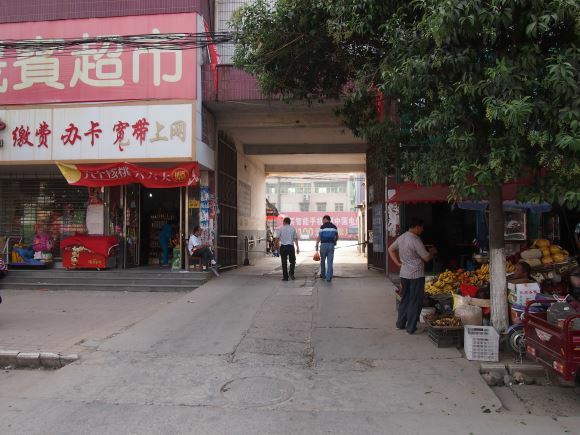 The hardest part is finding the bus station, which is hidden in a courtyard behind the buildings on the road leading out of Lushan Railway Station. From the railway station, head South (straight ahead). As you are approaching the main road at the end you will see an entrance to your right between the buildings. There is nothing in English, nor any signage to indicate it is a bus depot. *UPDATE: Thanks to Sean who mentioned as of 2017 there is a new entrance to the bus depot around the corner at the front entrance. When you arrive at the bus depot, it might be useful to have a picture of the Spring Temple Buddha to show someone. 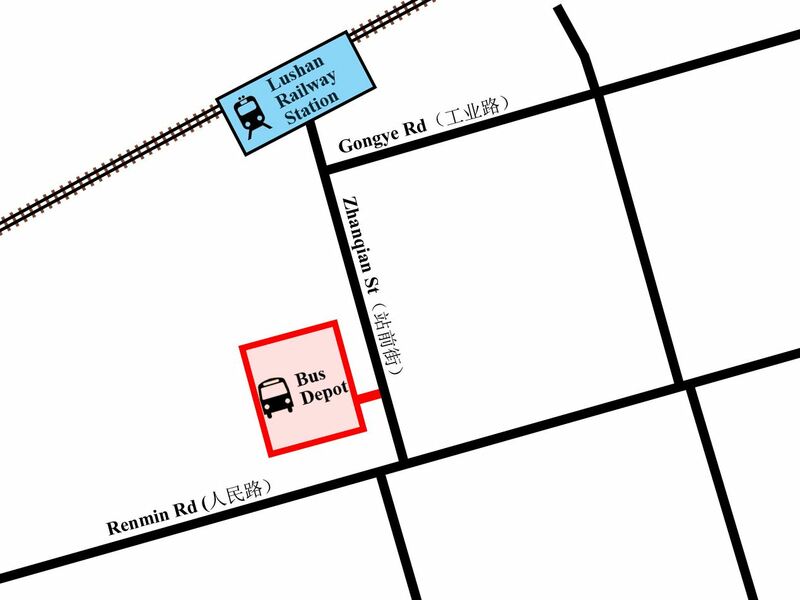 Otherwise say “dafu” (pinyin: dàfú) – literally “Big Buddha”, and you will be pointed to the correct bus. *UPDATE: Thanks to Sean who mentioned as of 2017 bus tickets can now be purchased at a window from the front entrance to the bus depot. As there will surely be no other foreigners on board, the conductor will let you know when you reach the Buddha. In any case, start looking out the window for the statue after 1.5 hours into the journey – you should be able to see the Buddha when approaching it. The bus will drop you off at a very small town (see picture below). Take the left road at the sign and a couple of hundred metres up the road will be the entrance to the Spring Temple Buddha. Congratulations! You have arrived!! Simply return to the location your bus dropped you off. Regular bus services pass through and go back to Lushan. Just wave one down – you will probably hear it coming as bus drivers in this area make good use of the bus horn! Handy hint: there is also a public toilet on the corner here across the road from the shops. Hi, in october I will travel to Xi’an and I want to know how to go from Xi’an to Spring Temple Buddha. What do you recommend?? I would recommend taking a train from “Xi’an North” station to “Luoyang Longmen” station (1.5 hours). 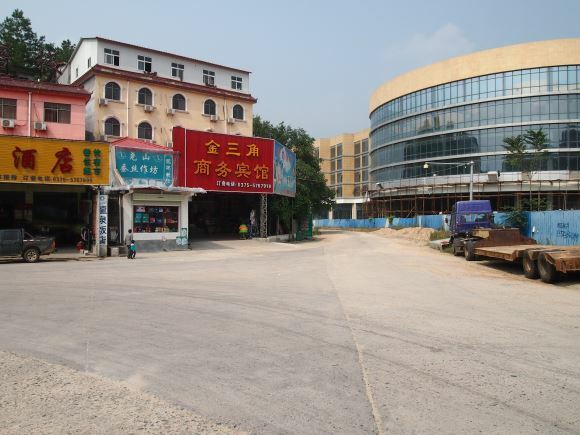 You will then need to transfer from “Luoyang Longmen” train station to “Luoyang” train station. This requires a 1 hour bus trip, but there are regular cheap local buses that depart outside Luoyang Longmen station that take you directly to Luoyang station. Follow the links mentioned above to find the train timetables and to make a booking. Book in advance because train tickets can sell out. 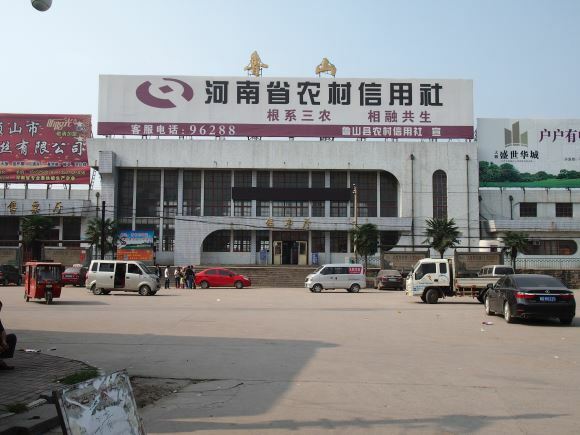 From Luoyang station you can catch another train to Lushan (2.5 hours) – just follow the instructions above. If you have the time, it’s worth visiting the Longmen Grottoes which are not far from Luoyang Longmen station. Thanks a lot!!! It was very helpful!! Currently on the bus to Lushan from the Spring Temple Buddha. Directions are correct as of today (29/10/15). The old sign has been replaced with a new one, and it should probably be noted that to the right of the sign are a few new buildings, one of which looks like the entrance. It isn’t. Continue on the road, i.e. to the left of the sign and you’ll get to the entrance. Bus fare was 13 rmb, entrance fees unchanged. Great directions. Thanks for sharing. Great, thanks for the info Aaron. I have updated the information. Cheers! How many meters or minutes are from the bus stop to the sign or entrance??? When arriving to the entrance how many hours do you recommend staying?? Im planning arriving at Lushan at 5am, do you know what time does the buses start to leave for the Spring Temple Buddha??? also what time does the Spring Temple Buddha open its doors to travellers?? From the bus stop to the sign (which now looks different to the picture above), it is about 100 metres, and from the sign to the main entrance is about another 500 metres. I think 2 hours would be plenty of time – I was there for 3 hours but I was taking my time and taking a lot of photos. According to a Chinese language website I found, the opening times are 8am – 5pm – I’ve just updated the statue info page to show this. As for what time the buses leave, I can’t find any info on this – I just know that when I went I caught the bus at approx 9:30am – 10:00am. Hi Jakob. There aren’t any direct trains from Lushan to Shanghai. You will need to transfer at Pingdingshan or Luohe. If you go to https://www.travelchinaguide.com/china-trains/ and enter in Lushan [Henan] to Shanghai it will give you a full list of transfer options. When I went on my trip I also proceeded to Shanghai, but I transferred at Luohe. hello , im not able to take the train or bus so Im planing on flying to either Nanyang and getting a taxi up to the buddha OR flying to Zhengzhou and taking a taxi , could you tell me what would be better? I will be flying from Xian. This information was really handy and accurate. I wanted to do a fly visit of this place with a very ambitious plan of returning to Xuzhou the same day and hence I would like to share how I did. 4: I started climbing at 7:45am. I reached the Toe at 8:45am. Lots of steps. Note: The ticket for going up to the toe can be found as soon as you go up the escalator. 5: I started down at 9:00am. Collected some photos that I took on my way up and on the top and reached the bus stop at 10:05 and a bus was just pulling away. Note: No taxis were available. 7: Train #4732 at 13:32 took me back to Luoyang station in time for my train to Xuzhou. Thanks George. Some great info there! Hey, awesome instructions. Thanks so much. As of today (November 2017), everything is current, except the entrance to the bus station. Instead of walking into that tunnel in the photo above, they tell you to walk around (to the left in the picture) to the front of the building. There’s an office to buy a bus ticket at a window, then you go through security and metal detectors before they let you into that bus lot. Price is still the same for the bus 13 RMB both ways. Also, train from Luoyang was super cheap too. 23.5 RMB each way. Thank you guys so much though. This article helped me plan the day perfectly! Thanks a lot for all the info. I have one more question if you don’t mind. 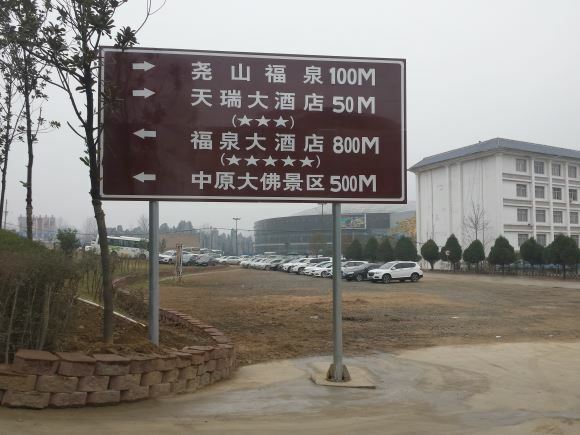 From what I have read, it seems that it is possible to get to Lushan from Luoyang only. Is that correct? Or maybe and hopefully it is possible to get to Lushan from other cities as well. Hi Daniele, you can catch a train to Lushan (Henan) from many places in China including Beijing, Guangzhou, Zhengzhou etc. 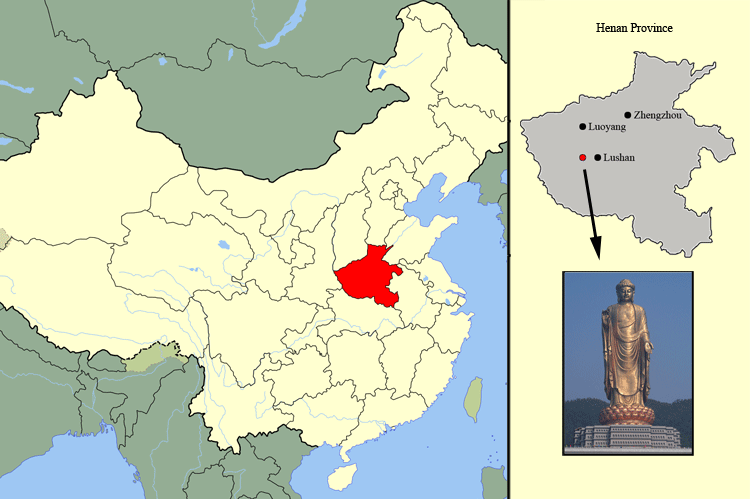 I just mentioned Luoyang as it is a fairly close major city. You just need to check dates and times to make sure there is a train that fits your schedule.